API: Last 12 months, this month missing data! We are running Piwik 2.16.1. The data in Piwik is showing but when we request the API last 12months we have the last month missing in data. 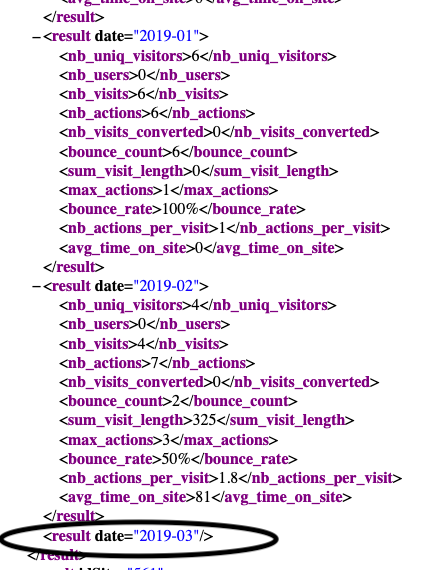 In MySQL We see that “piwik_archive_numeric_2019_03” has twice as many entries as last months, but IDs seem to be double… Maybe there is something wrong there? Hope someone can help us out with our missing data!! Keep in mind that there are 23 stable releases since 2.16.1. Chances are that one of them has fixed this issue. It was my php_imap.dll extension, i have commented this in php.ini and now it works. Found the issue with running Archive, which was throwing errors.